Bobrick B-6806X48 Concealed Mounting with 48" Snap Flange Grab BarsBobrick offers over 750 products for public washroom facilities. Bobrick has developed a complete lines of washroom accessories as well as toilet partitions and related laminated plastic products.Bobrick B-6806X48 Concealed Mounting with 48" Snap Flange Grab Bars Features: Satin-finish 18-gauge type 304 stainless steel tubing 1-1/2" (38mm) diameter. Bar passes through flange and is heliarc welded to form single structural unit. Cover snaps over mounting flange to conceal screws. Concealed mounting flange 1/8" (3mm) thick stainless steel plate, 2" W x 3-1/8" H (50 x 80mm), with two screw holes for concealed anchors. Cover is 22-gauge (0.8mm) stainless steel with satin-finish, 3-1/4" (85mm) dia. 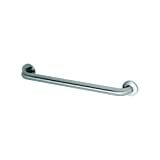 Grab bars that provide 1-1/2" (38mm) clearance from the wall can support loads in excess of 900 pounds (408-kg) when properly installed. Meets ADA Accessibility Guidelines in U.S.A. All joints and supports are contour cut and welded. Concealed anchors and fasteners available as an optional accessory. Peened nonslip gripping surface available.